The Wellington Mounted Rifles Regiment was one of four regional mounted rifles regiments raised to serve overseas in the New Zealand Expeditionary Force (NZEF) during the First World War (the others were the Auckland, Canterbury and Otago mounted regiments). 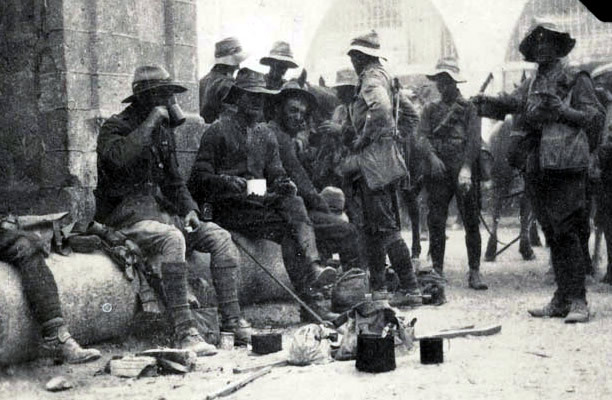 After the armistice with the Ottoman Turks in October 1918 the WMR remained in Palestine until March 1919, when it was sent back to Egypt to help suppress nationalist riots. The regiment was disbanded in June, when most of its officers and men embarked on the troop transport Ulimaroa for the return voyage to New Zealand. Cloth patch for the Wellington Mounted Rifles Regiment, worn on both sides of a soldier’s puggaree (hatband) from October 1917. 9th (Wellington East Coast) Squadron. Cap badge: A horse forcene over a scroll with the regimental motto. Collar badges: Smaller version of the cap badge. Motto: Fortes fortuna juvat (Fortune favours the brave). These squadron designations were intended to represent each of the three Territorial Force mounted rifles regiments from which the WMR drew its personnel. As far as possible, each squadron drew its recruits from its geographical region until September 1917. From then on, men were sent overseas as generic mounted rifles reinforcements but were still generally assigned to their region’s unit.